The Bree Louise is just round the corner from Euston Station and must be doing something right as it’s always extremely busy whenever I go there. So don’t ever expect a relaxing and cosy experience here. 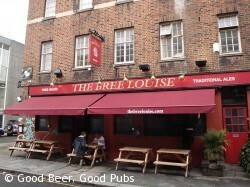 Firmly committed to real ale, the Bree Louise has up to 18 beers on at any one time – most of them served by gravity from barrels set up behind the bar, but with some from handpumps. CAMRA members have an extra incentive to drink here as production of a valid CAMRA membership card will get you 50 pence off the price of a pint. The beer quality at the Bree Louise is consistently good, but watch out if you’re ordering beers from the gravity barrels that are normally served through a tight sparkler – you may not get the head and consistency you’re expecting. I once got caught out here with a pint of Brains Dark that had no head at all. Food is available from midday to 9pm every day and your CAMRA membership also gets you a discount on the excellent pies they serve. Definitely worth a trip if you are in the Euston area. The pub and the surrounding area are all threatened by the proposed development of HS2 – the high speed railway from London to Birmingham. See Save Drummond Street.